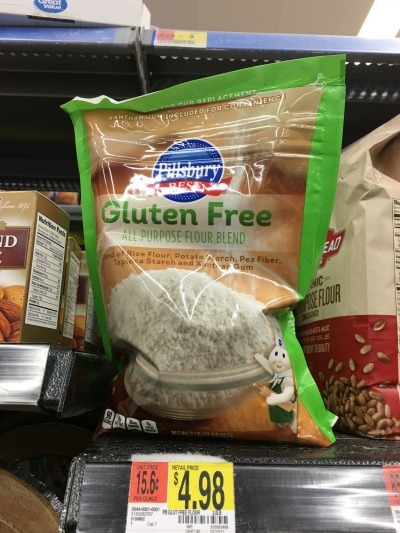 Gluten free pantry items are an important part of learning how to eat gluten free. If you are gluten free, or if someone you love is gluten free, here are the essential gluten free pantry staples and kitchen equipment that you should add to your gluten free shopping list. These are the products I use in my kitchen ALL of the time, and you will see them listed in the gluten free recipes I create and share with you. I am happy to advise you if you have any questions on any of these items, how they work, what to make with them, etc. I love to cook and bake, and I have a lot of what my family likes to call “kitchen toys” to use. Everything I list I own, have used, and rely on to make delicious things for my readers. These are the gluten free flour blends, and flours I use almost on a daily basis. I have used each and every one of these flours, and I know they work in my recipes. Bob’s Red Mill 1 to 1 Gluten Free Flour Blend. This is the gluten free flour blend I use most here on my blog. This flour blend works really well in so many of my recipes. It keeps my gluten free baking light and fluffy! Pamela’s Artisan Gluten Free Flour Blend. I like this gluten free flour blend too. It uses guar gum instead of xanthan gum as the binder, so if you can’t eat xanthan gum, this could be a great option for you! Authentic Foods Gluten Free Multi-Blend. I love all of the flours from Authentic Foods. They are ground incredibly finely, and this high quality really shows in your baking. Authentic Foods also makes individual flours for those who like to make their own gluten free flour blends. If I were to make my own blend, I would only use their flours because of how finely ground they are! Sorghum Flour, White Rice Flour, and Brown Rice Flour. Anthony’s Goods is a great resource for a LOT of gluten free ingredients as well! I love their Arrowroot Starch, Almond Flour, Peanut Flour, Xanthan Gum, and Coconut Flour. Many of their products are also organic and their prices are great! Coconut Sugar is one of the most used sugars in my kitchen. I love the slight coconut taste it adds to my baking. I tend to use Anthony’s Coconut Sugar, Big Tree Coconut Sugar, and Trader Joe’s Coconut Sugar the most. Maple Syrup. I tend to use Trader Joe’s Grade B maple syrup almost exclusively in my baking. Grade B is darker and has a bolder maple flavor than Grade A maple syrups. Organic Cane Sugar. I tend to use organic cane sugar a lot when I have to use regular sugar in my baking. Anthony’s Organic Cane Sugar and Wholesome Organic Cane Sugar are the two I use the most. Powdered sugar. I tend to use organic by Wholesome brand, which is in my local grocery store. I love to use nut flours in my baking, so I add a variety of them to my gluten free pantry. Nut flours add protein, which can help balance the sugar in baked goods. I do buy almond flour, but I tend to make other nut flours on my own. If you want to make your own nut flour, I LOVE this Cuisinart Immersion blender. It has a food processor attachment (and many other attachments that I use all of the time!) You can check out this Gluten Free Chocolate Walnut Cookie recipe to see how I made my own walnut flour! I primarily use two companies for almond flour. Anthony’s Almond Flour and Bob’s Red Mill. In my gluten free pantry, I primarily have a stash of olive oil, avocado oil, and coconut oil. For high heat cooking, avocado oil and coconut oil are the best. Olive oil will go rancid at high temperatures so keep an eye on that! Coconut oil is by far my favorite oil, it is delicious in cooking and baking. I use Anthony’s Coconut Oil, Nutiva Coconut Oil, and Trader Joe’s brand. Avocado oil is light and it has no obvious avocado flavor. I use Chosen Foods Avocado Oil mostly, but I have also tried and liked La Tourangelle. Olive oil – where do I start. Olive oil is one of those oils that often price does make a difference. Honestly, we have a local store that makes their olive oils in-house and I buy my oils there. The Olive Bar (not an affiliate link!) does ship their oils if you want to check them out. They infuse flavors into their oils too, there are dozens of flavors! Slow Cooker. This is what I love about those school days where I know I won’t have time to make a healthy dinner. Just toss ingredients into the slow cooker and come home to dinner. My favorite slow cooker recipes are my 5 Ingredient Pulled Pork and my 5 Ingredient Pot Roast. Instant Pot, though I have a no-name brand by Cosori, this has been an amazing time saver for me!! You can roast a whole chicken in just 30 minutes in a pressure cooker! My favorite pressure cooker recipes are these Gluten Free BBQ Turkey Meatballs and this easy Gluten Free Blueberry Oatmeal. Cast Iron Skillet. I use my cast iron skillets ALL of the time. They can be a little tricky to care for, but they are so easy because they can go straight from the stove, to the oven. I have 10 1/2 inch, 12 inch, and mini cast iron skillets! We all want to save a little time in the kitchen! These are my favorite items that make kitchen prep a breeze! I know I mentioned this Cuisinart Immersion Blender a few times. It purees soups, comes with a mini food processor, has a whipped cream attachment, and it is just plain AWESOME! Don’t laugh at this one, but a lot of my recipes call for shredded meats. This handy tool shreds meat really quickly! I love my spiralizer. I went through a few different ones before I found one that won’t break, and is easy to use. Vitamix is a power horse in the kitchen. It not only makes smoothies, and no-churn ice creams, but it is great for savory things like soups too! Baking pans in 8×8 and 9×13 sizes. A non-stick bread pan. These are not only great for bread like this Gluten Free Pumpkin Bread, but you can also use them for freezing ice cream! Madeleine pan. I have a few delicious Madeleine cookie recipes on the blog. I make a ton of gluten free muffins! This is a great muffin pan for making your own muffins. Another one of our favorites is this Babycakes Mini Donut Maker. You can also use this donut pan to make the donut recipes on my blog. This is my favorite cake pan in my cake recipes. Love those mini layer cakes I made (Gluten Free Chocolate Cake and Gluten Free Carrot Cake)? These are the layer cake pans I used. I love making bundt cakes. This pan is on my wish list as my old bundt pan is on its last legs! I used it in this delicious Gluten Free Lemon Bundt Cake recipe, Gluten Free Vanilla Pudding Raspberry Bundt Cake, and others. I also love these mini bundt pans that I used in this Gluten Free Matcha Green Tea Bundt Cakes recipe. These mini springform pans are perfect for mini cheesecakes like these Gluten Free Peanut Butter Chocolate Cheesecakes. I use these little round tart pans all of the time. Check out these Gluten Free No Bake Fig Tarts. This large rectangle tart pan is also a favorite. See this Gluten Free Chocolate Tart or this savory Gluten Free Goat Cheese Asparagus Tart recipe. Ramekins make perfect single serving desserts like these Gluten Free Lemon Sour Cream Cakes. This waffle iron isn’t just for breakfast like these Gluten Free Banana Flour Waffles. You can also make this fun Gluten Free Birthday Cake Batter Waffle recipe! Lastly, I LOVE this bread machine. It has a gluten free setting, which makes it so easy. You would also want to pick up a copy of my friend, Jane’s, Gluten Free Bread Machine cookbook! I know this was a CRAZY long list, I hope you made it through to the bottom! As always, you can always reach out to me if you have any questions on any of these ingredients or products! !